With any business whether it be a large corporation or a small website like BrickPicker, business models change. At times, you need to ask yourselves what it is that you are looking to achieve with the product you are working on. Since the beginning, Ed and I have always set out to try and help the LEGO investor and reseller save and make money.Today we are announcing that Brick Classifieds will be changing to the FREE / NO FEES model. I don't think you can really complain about that now can you. We want to help you, the LEGO investor/reseller, to move your product. Hopefully with some of the new tools that we have added to the system and the new ones that are being worked on right now, you will help spread the word to check Brick Classifieds first to find the best prices on LEGO items. Since there are no commissions taken out of your sale, we hope that you will work to price your items accordingly. If you are not going to lose fees, you should be pricing it lower on Brick Classifieds than on the other marketplaces so that you can still make the most money. Lower prices will help bring new buyers. Once buyers learn to check Brick Classifieds for best pricing, they will check Brick Classifieds first which means more money in your pocket instead of someone elses. We have made some updates to the product detail page of Brick Classifieds. We have included listings from other Brick Classifieds sellers as well as listings from eBay and Amazon. We are trying to show the buyer where they can get the best deal. If you, the seller, do your job correctly, they should want to buy the product from you and not go to the big shops. If the prices are better on eBay or Amazon, hopefully the buyer will click through and Brick Classifieds can earn some revenue through affiliate programs. Over the next few days we will be adding feeds from BrickOwl and still looking to see what can be done with BrickLink. Removed the Trade feature. That has now returned to the BrickPicker forum. One of the big things we want to do is help spread the word about Brick Classifieds. We created a tool that will allow you to select random products in your store or pick the actual items you want displayed. 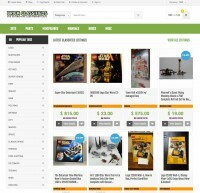 It will create a snippet of code that you can use to display your store products on forums, websites, eBay, where ever. Just paste the code we give you and your items can be shown anywhere. Everything you need to sell LEGO items is here for you. The price is right, that is for sure. The thing is to get the word out, price aggressively and get the buyers out there to learn more about your shop here on Brick Classifieds that has great prices. Viral marketing from all of you is the best way to get people to see your listings. Price the items better than eBay, Amazon, etc. They will buy from you and you will save on the fees. It is a win for everyone. Put a snippet about Brick Classifieds in a eBay listing here or there to let them check out your store. I am sure they would be happy to pay a lower price and know that you are most likely padding the price to help pay the eBay fees. "Since there are no commissions taken out of your sale, we hope that you will work to price your items accordingly. If you are not going to lose fees, you should be pricing it lower on Brick Classifieds than on the other marketplaces so that you can still make the most money." Excellent visionary statement. I like the new business model. I like that too. A lot of overpriced listings on there. Maybe this helps. We are going to try and give people the opportunity to make some money, but for in order for this to work, people have to charge LESS than eBay and Amazon. Over time, if people charge fair prices, the word will get out. We have some other things planned as well, but it's really up to the sellers to make this work. I was really going to write much of what Ed just said. This is such a home run for sellers. We are going to try and show buyers that the best deal is here. Honestly if I see some outragous pricing, I will be notifying the seller to go take it to eBay. I really don't want that on here. We want people to move product and no one can yell at us about it since we make no money from the sales. If you want to list a Falcon for $10k, go do it on eBay. If sellers start sharing their links and talking in other forums about getting good deals on Brick Classifieds, the people will come. For example a Town Hall at $500 on eBay in general you will lose $45-50 in fees. You can list that here for say $470 which looks like a home run to a buyer and you will still make more money than you would on eBay. Everyone wins. That is the type of dealing I would love to see. That is how the word will get out. If people are priced higher here than on eBay, Amazon. I know I wouldn't buy it on Brick Classifieds. I would just love to see some sellers start to share the word about checking out their stores here with good pricing. We did our part, now its time for sellers to do theirs. Wow. I've adjusted my price accordingly. I do feel mine is now cheaper than something you can get on Ebay. I hope you can find some middle ground to recoup money. Yep that is the best price out there for an SSD. I posted it on the Brick Classifieds Facebook page. I will be more than happy to keep posting great deals. Just let me know about them. If BrickClassifieds had an actual API, I could add BrickSync support and give easy access to a third marketplace to a bunch of sellers, with a 2-3% discount on listing prices by default. Though, that may not make a big difference as most BrickOwl/BrickLink sellers aren't focused on sets. You are right. Talking with BrickOwl, most of their business is parts and figures. From what I have seen, sets on Brick Classifieds is already much lower than what they are listing them for on there. Sure, help out your cause. That is what it is there for. Wow Jeff, very cool. I just went through and dropped all my prices 10-20% to maybe help drive traffic to the site. There's something very wrong with those results. Typing in 'Star Wars' in the search bar, by itself, with no changing of any options or clicking any other button besides hitting <Enter> or clicking on 'Search' should return all Star Wars sets listed in the classifieds. Obviously, if someone names their store the same as a theme or series of LEGOs, the search function gives you that person's storefront. That has to be fixed. My suggestions would be to remove store names from this search. Add an option to click through to get to an option to search for a store, but it shouldn't be included here. If you truly want BC to be the best place to buy LEGOs, then you need to approach every aspect of the site as if the stupidest person on the Internet is going to be the next person to visit the site and want to buy $1000 worth of sets. While I agree with you that searching for "Star Wars" should bring up all listings that match which it currently does not, might I suggest you tone it down a notch? As a fellow programmer I find statements like the ones in bold extremely confrontational and not helpful. So if you didn't mean to be so bold, I apologize, but your suggestions make it seem like a) Jeff is/was getting paid to get BC up and running and b ) he doesn't spend time away from more important things (such as his family) to keep BC and BP running for us. I was confused when I typed in 'Star Wars' into the search field and saw no results. I'm not sure how difficult it is, but I think it would be really helpful if you could search by more than 1 keyword as a phrase that appear in listing titles. For example, I typed 'Star Wars' and got no results but when I type 'Star' I get lots of results. Also, I'm not really sure how useful it is to search the storefront names from there by default. Maybe it is, maybe it isn't but I wasn't expecting to see store names in my initial search results. Maybe a click through to 'store results' or an advanced search option might be more appropriate. Jeff I really appreciate all the hard work. I'm offering my initial reactions to try and help out. I think that the casual buyers might be put off if they don't get the search results they're expecting. Yes it hits a nerve. BTW I do think the search should search the titles... I think most of us around here are just used to searching by set # which works great! As a fellow programmer I find statements like the ones in bold extremely confrontational and not helpful. @Loghamel has a very good point. As a fellow programmer, I consider writing a decent search to be a trivial problem. My part inventory management software (not yet public) is using word-based truncated Levenshtein distance. It's able to find stuff through typos and any other error. No matter what I type, it's going to list what is closest to what I'm typing, with results appearing instantly at each keystroke. Brick Classifieds also needs a powerful search engine, this is fundamental. Sure it's important, but so is the rest of what Jeff has put together to this point....(well most of it, heh). My point wasn't that it wasn't important, it certainly is... My point is that the opinions were expressed rudely and (in case nobody noticed) I'm pointing that out from now on and asking members to adjust how they communicate. Great... now I have to google Levenstein distance to see what it's about. Eh, true Levenstein is O(n^2) which is unpractical, but you can use a truncated search just to catch typos of 2-3 characters. A word-based but order-sensitive search also ensures better results, as is using extra contextual information. "2x1 palte with stuff on teh sidde"
Result #0: "Plate, Modified 1 x 2 with Handle on Side - Closed Ends"
Result #1: "Plate, Modified 1 x 2 with Handle on Side - Free Ends"
Result #2: "Hinge Plate 1 x 2 Locking with 1 Finger on Side"
Result #3: "Hinge Plate 1 x 2 Locking with 2 Fingers on Side"
Result #4: "Plate, Modified 1 x 2 with Clip Horizontal on Side"
Result #5: "Plate, Modified 1 x 2 with Towball on Side"
Result #6: "Hinge Plate 1 x 2 with 3 Fingers On Side"
Result #7: "Plate, Modified 1 x 2 with Angled Handles on Side"
Brick Classifieds also requires a search engine at least as powerful. That's cool... how does it handle unmatched words? I.e. the work "stuff"? Does it handle out of order words or do they have to be in order as your (admittedly small sample of) results suggest they might need to be in order? On^2 huh? Yeah, I remember that from my university days... How does that kind of a search affect server load? I know from personal experience that web servers eat resources like pigs so the extra burden of many users relying on that type of search seems like it's screaming for multiple web servers. Looks like Jeff has some weekend reading to do. Good feedback on the search. Already added to my project list to figure out what is going on. 99% of the time i will type in things like '10188' and get results. I agree, it needs to work better like eBay/Amazon and will work towards getting it there. With so many other tasks on a new site like this, it was not something I'm concentrating on, but like I said, I will improve it. I'll let you decide if we should take that to a PM. It's way off-topic, but I figure the Brick Classifieds crew might also be interested. The search must be word-based purposely so it will find stuff even if the terms are out of order, but it should also be order-sensitive (basically, a small penalty cost is added for words being out of order). Unmatched search or target words also add to the "matching cost". Processing time is only O(n^2) if you want to catch any typo (like "Star Waaaaaaaaaaaaarrrs"), but you can give up after 3-4 characters to keep processing time under control. No one makes 20 letters-long typos! Here, with a typical search string, it take 14ms to assign a "matching cost" to all 95000 items of the BrickOwl/BrickLink hybrid catalog and sort the results. But this is optimized C code, these web languages 200 times slower than real code might cause problems... Then again, surely you can call upon real code on a web server. I don't believe there is any rudeness in any of what I said. I've had a computer since the age of 9 when my parents gave me a Commodore 64 in 1985. I won't get into what I've done or can do. I was speaking to the administrator of this site who obviously knows what he is doing as does his brother, which is evident in the quality of the website and the many functions they have implemented. It's called constructive criticism which I'm sure you know all about because as a coder, you will rarely never get it right the first time, but will perfect it over time as you show your work and get feedback from either the client or your boss. Wanna know what is rude? Calling someone out publicly for a perceived tone in a post that you felt must be done. Further, you paraphrased my post as an example as to how I should post in the future, as if I have a field of craps growing that I could give away. I don't need you to 'teach' me your magic linguistic skills or how to select the proper tone for my essay. It was a post that was appropriate for my target audience, not a dissertation that was going to be peer reviewed. If Jeff had a problem with it and wanted to blast me publicly for it, I wouldn't hesitate to apologize. I appreciate all of his efforts and believe that the classifieds can be exactly what he's wanting them to be. It's actually a brilliant idea that I can't believe other LEGO websites haven't worked harder to accomplish. I had other choice words for you, but deleted them as to 'adjust how I communicate.' I think you'll get both my point and tone. Everything is cool. I appreciate the criticism. I know there are a ton of things that can be better. I have a project list of 87 items for Classifieds and that is probably 500 short of what it should be. Same goes for Brickpicker. I truly wish I could quit my day job to work on both of these full time to get rid of that list (then again, we all know it never ends). People finding things to me finally means that people are paying attention or trying it out. I can tell traffic has already improved since this went to zero fees, more vendors are trying it out and hopefully more buyers will be testing the waters. I will continue to build, improve, add, etc. I just need solid support from vendors to help get the word out. No one really has anything to lose. It can be the greatest "Craigslist" of LEGO out there. There is only money to be put into peoples pockets and hopefully savings for the buyers. I keep repeating the phrase, but everyone can win in this. I have no problem with feedback. I have built a pretty solid skin over the years and will work on making it better. We are working on adding solid shipping system in there for tracking, labels, etc. I will get this search fixed as soon as I can and we will continue from there. Hopefully this will be a big hit and you can do just that!! And I don't look at it as being the greatest CL of LEGO. I see it as possibly becoming THE place to buy LEGOs. The thing with CL is that you have to meet up with a total stranger. Not bad for a $35 Nike Jumpsuit. But for an $800 GG? Sure, I'll meet you. Let's find the closest police station to both of us and I'll meet you in the parking lot. Shipping something to someone on CL just always feels like you're being scammed. This would kill both of those birds. No fees to list or sell? 'Why the hell not?' is my response. As you said, it's just a matter of the masses getting the word and then trusting the transaction, which I have complete confidence in your implementation of both.